There are many charming towns in the foothills of the Sibillini with wonderful views of both the surrounding fertile hills and the peaked mountains to the west. Amandola is one of these towns and is considered the gateway to the soaring and majestic Sibillini Mountains. 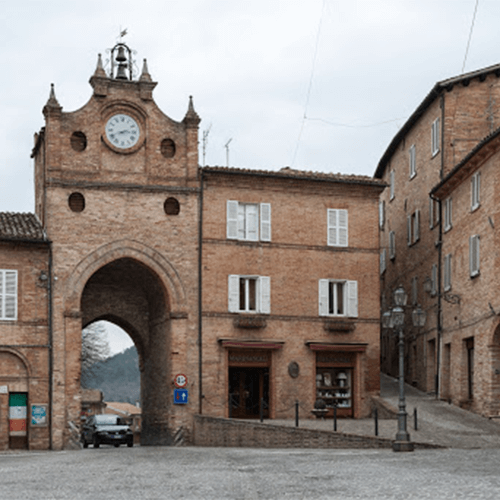 The centro storico of Amandola sits on a hill, with the pretty Piazza Risorgimento welcoming you just as you enter the town. The two prominent features of this piazza are the 14th century Chiesa Sant’Agostino, which sits slightly lower than the piazza at the base of a wide staircase, and on the opposite side of the piazza the narrow Porta San Giacomo, which regularly has a few cars waiting their turn for oncoming traffic.